Meet DroneALERT's CEO, Brooke Tapsall: Her thoughts on C-UAS, industry inclusion, and new EU drone regs. In our first trans-Atlantic podcast we talk with DroneALERT’s, founder and CEO, Brooke Tapsall. 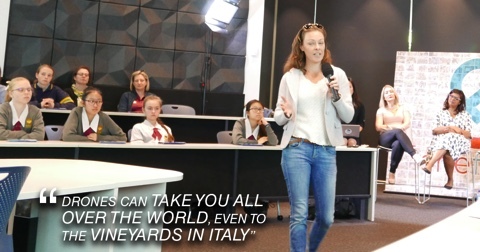 We learn about her journey from EU Commission scientist to CEO of a hot drone industry startup that's rewriting C-UAS and how to inspire women and girls to pursue STEM careers. We round things out with a discussion of the March 2019 changes to EU drone regs. We talk about her company's new app that combines drone reporting with an alerting system. Could this app serve as the foundation for all new C-UAS efforts? How do we transform a male dominated industry? We talk with Brooke about how to inspire women and girls to pursue careers as executives and operators in the drone industry. On March 12, 2019 the European Commission approved a new risk and performance-based framework to streamline the regulatory process. We talk about drone operations in the EU, what Europe gets from the new structure, and BVLOS across countries. Toby the Wonder Dog. Woof! Do you think your team is ready for the field? How do you make your customers comfortable with your flight operations? Maybe a canine companion can help you break the ice. More importantly, just how smart are these Australian shepards?